2. Browse for the path of your Tsukihime install and the path that you’d like the converted files to go to. 3. Press convert. Everything should be straightforward from here. Wait for a message box to pop up to say that the conversion has finished. 4. Go to the output folder. You’ll find two new folders there: “Tsukihime” and “Tsukihime.app”. Copy the contents of these two folders to your iPhone with iFunBox to these paths: “/User/Media/ons/Tsukihime” and “/Applications/Tsukihime.app”. Create the “ons” folder if it’s not already there. If you do not have root file access to your iPhone, go into Cydia and install afc2add. 5. Install OpenSSH from Cydia. 6. Get your iPhone/iPod Touch IP address through Settings -> Wi-Fi -> Click the arrow button next to the network you’re connected to. 7. Open up FileZilla. Connect to the IP you just got from your device with port 22. The username is “root” and the default password is “alpine”. 8. CHMOD the folders you just copied to 777 (Right click -> File Attributes). Make sure you have checked the “Recurse into subdirectories” option. 10. Respring your device. A “Tsukihime” icon should have appeared. 11. Play 🙂 The white buttons on the right from top to bottom are: Esc, Enter, Ctrl, Up, Down. If you have any problems/questions, leave a comment here. Unfortunately, the endings that you reach do not register in your save so you won’t be able to reach the Far Side routes unless you download a completed global.sav and copy it onto your device. Hello, I was trying your walkthrough and followed all the steps in order but I encountered trouble at step 9. after I logged in using su root and I went to do the “apt-get install ldid” command in MobileTerminal and it simply said the command was not found. Hope you can help. This was a great walkthrough up until then and I can’t wait to be playing this on my Iphone! That’s very strange. I thought apt-get was part of Cydia. What’s your FW and how did you jailbreak your device? Try going into Cydia and look for APT packages or something. That did the trick! I can’t tell you specifically what was missing as I just went and downloaded every APT thing from Cydia on the list, but one of them did the trick! I’m very excited to play this, thank you for all your hard work! Hello, it works for me. In my first attempt to launch the game, it didn’t launch. The reason is I used winscp to copy and chmod the folder, but I didn’t choose the option “Recurse..”. Hi, I installed the game and for the most part it works great. However, there is one problem. Every time I Ry to save the game, it crashes. I did use a completed gloval.sav and unfortunately, did not test out the save feature before that. Strange… what is your firmware? I’m running 3.1.2 on a black-rained ipod touch 3g. When I don’t have a foreign gloval.sav, I can save just fine. @silkroad, try finding another global.sav or something. I have 3.1.2 and it is working fine. Alright, I’ll check it out. Do you add the gloval.save file using iFunbox or with filezilla? Also, something that I have noticed when I’ve been looking for gloval.sav files on the internet is that they are sometimes bundled with a nscript.dat file. Do I need to copy that onto my ipod as well? I used iFunBox. And no, you shouldn’t need the nscript.dat file. Please note that you only have to pseudo sign the app with ldid. Setting the system variables makes you unable to connect to unsecure wifi networks. is it possible to actually label those boxes? Okay, I did the “777” thing to the files correctly, but now I get stuck at step 9, part 3. I installed “aptitude” and still I get the same error. I really appreciate you feedback, thanks! I got the “ldid” command to work. Did everything else as described. Restarted and resprang my iPhone. The Tsukihime app was still a white icon. When I try to open it it seems to load something with a black screen, then it stops and returns to the home screen. Tried several times.. Nothing. Is that where it should be found? The files being in the wrong place is the only thing I can think of that’s wrong, but I’m not sure. can you tell me how you got the Idid files to work? i too would like to know how you got the Idid files to work. Using Ipod Touch 2G MC model. firmware 3.1.3, JB-ed with spirit. Would you mind posting the source to this? I’d love to jury-rig it and see if I can get a few other onscripter visual novels to work. What source do you want? If you want the onscripter source, it’s on ogapee’s website. The source for the little application you made that handles the nsaconv stuff. I’ve ported both Kagetsu Tohya and Saya no Uta over with great success. Your modified version of onscripter seems to work with everything. I’m going to try to get Umineko over later on. Great job! I’m guessing you ported over the PONscripter version of Saya no Uta? Unfortunately I lost the source to the little app but I will probably make a new one soon. And good luck with Umineko. The text somehow did not work too well for me…. Hmmm, I didn’t get this error. Tsukihime works, albeit with a white icon (is it supposed to have a real icon? I would imagine it would, but I dunno), though I had some odd things happen after the install. My wi-fi connection icon in the upper left no longer showed up (I was able to go online with safari, but the settings menu also said no wifi connection), and when I tried to use the mail app, it would say that “No password exists for this account”. I’ve used the mail app every day for months, and never messed with the password since it has always worked. I headed to the settings, and the password field was blank… put the password back in, try mail again, and it still kept giving me the same error, each time I’d leave the settings menu, the password field would be blank again. Anyway, after being annoyed by that, I decided to try a few things… I uninstalled all the APT libraries I had downloaded via Cydia for this install, though there is one that comes default with Cydia and needs to stay, it will give you a warning if you try to uninstall it. After removing those I did a full reboot on my device, and things seem to be working again. I presume it just needed the full reboot rather than a respring, but for tethered jailbreaks such as my own, a reboot is kind of a pain, so I left that as a sort of last resort. Very strange indeed. At least you got everything working in the end. The white icon is there because it is a blank icon (there is no real icon). The reason this happened is because in step 5. sysctl -w security.mac.proc_enforce=0 security.mac.vnode_enforce=0. it changes some settings on the iphone which causes your wifi to not be able to connect in settings and your email to screw up. To change it back, I think you simply reset the variable to 1 or reboot your phone, like Kamano did. Also, I spent hours looking for the ldid package because i thought the l was a capital i. >.<. They look exactly the same. And if someone could help me, my pictures on Tsukihime aren't working such as the character sprites. I get the same problem as cloudstriker. I also noticed that my “recurse into subdirectories” never stays checked no matter how many times I do it. Can someone help? I tried the -s instead of -S and I made it 777 but I keep getting the same problem. What is the point of step 9? Tsukihime worked for me even without doing step 9, can you fill me in as what kind of error I would run into if I don’t do step 9? Which jailbreak/firmware were you using? I think some jailbreaks will allow unsigned code to run without having to pseudo sign it. And no, there should be no problems if it works for you. I can’t get this to work, I’ve done everything as said but I only get a blank Icon that says Tsukihime. It loads a black screen and then it closes. Mmmm…. Well the only question that I really want to ask is it crashes when I try to save with (my) completed gloval.sav. I mean, everything worked perfect for me, but I was bummed when I found out that it crashes. Just wondering why it does that. 😛 Oh, and I also want to port over KT but i’m too confuzzled with this kind of stuff. Thanks in advance. Is there a way to do this if I don’t have wifi to my computer? Or a program with the same function as MobileTerminal (set permission, commands…) without have to use wifi (use usb instead)? diskaid and ifunbox can be used to copy the files… permissions and signing the app could be done using ifile (cydia shareware, i really recommend it) and mobileterminal (cydia app). To install these two apps you would need to use wifi from somewhere to connect to cydia, or download the .deb files from the internet and install them through usb. Thanks for the answer, but how do you change permision (and signing) with ifile? I have a problem. I’m using a jailbroken iphone 3.1.3 by spirit and I followed all the steps but for some reason once I click on the app it shows me the a blank screen with only the keyboard things at the bottom. It might be because everytime I try to convert I get a notice saying “out of system memory” can u please help. Yes it is probably because of the error with the converting. I’ll try to fix this soon. I seem to be the only person who hasn’t even managed to get through step 3. Every time I try to convert, it gives me a file not found error. Weird… Ok try using sarconv and nsaconv manually to resize the images. Umm, by that, do you mean that I should go into CMD and do something like “sarconv 800 640 arc.sar arciphone.sar”? What do I do with the resulting files? Yep, copy all the files from your Tsukihime Installation folder into a new Tsukihime folder (this will be the folder that you’ll copy to /User/media/ons/). You don’t need to copy the executable into there. Then paste in your converted .sar and .nsa archives into that folder, replacing the old ones. Thanks a lot, almost got it, it’s just I can’t figure out what the original res is supposed to be, and guess and check is getting me nowhere :-?. For an iPhone 3g, the final res should be 480, right? Dangit, that was it, I had the resolution right but I completely forgot about the sidebar. Now I feel like a huge retard. But it feels good to finally have this thing working, I’m really grateful to you for walking me through this. Dude let me just tell you, your whole tutorial is some dumb thing. Do you realy except someone who has no experience in this to understand this crap? couldn’t you just make a video to explain it all? It’s full of bugs and problem who hasn’t been fixed yet. I’m in step 9 and i can get anything fixed, even in step 3 when I convert I get a .NET message error. do we realy need to do all this to get tsukihime signed? I’ve already tried to make the steps as idiotproof as I could (judging by you it looks like I’ve failed). If you don’t like it then don’t use this tutorial. As for the converter, I’ve tested it on many different versions of Windows and computers and never got that error. At least try reading some of the other comments. I told another person an alternative way to convert all the archives by using the onscripter tools directly. Don’t take it bad Im not saying you’re an idiot, I’m saying this whole tutorial you made is bad. And it is, sorry but it is. In order for people to understand it more clearly would be to explain what they are doing or to make a video to show how you do all this. And about that error, i keep having it. I’ve read all the comments and i was bout to do it but I dont know the command ive got to enter in CMD in order to use thoses files. Just tell me what is the commands I’ve got to enter into the CMD? Seriously I cant manage to get it converted to 100%, it always says “system.outofexception” or something like that. Just jailbroke my iphone 4 on 4.1 firmware with limera1n and I am having trouble getting this to work. I can get everything fine up until step 9, I think. after inputting these commands in MobileTerminal, nothing happens. Not sure if I am supposed to get some sort of confirmation in MobileTerminal, but I’m not. Tsukihime is on my iphone, but the icon is white and if I try and open it it immediatley closes. I did have a few problems converting it and got a “systemoutofmemory” error, but that stopped after I converted it to another drive. Also when I go through filezilla, checking “recurse into subdirectories” never stays checked. Any ideas what I am doing wrong? Nothing should happen in MobileTerminal (no confirmation) when you input those commands. In fact, you might not even not need those commands depending on your jailbreak, chmod’ing the binary file (ie the onscripter file in Tsukihime.app) is more important. Also, I think the “recurse into subdirectories” things shouldn’t stay checked. It is after all an option, not the status of the folder. Yeah, my problem was I forgot to change “GameName” to Tsukihime in info.plist and SDLAppParam.Plist. Thanks for the quick reply. Doomy please could you be more precise on how you did to fix the “sistemoutofmemory” error? When I converted it, instead of extracting(is this the right word?) it to program files or something, i extracted it to an external hard drive. I keep having this error, and im pretty sure that everything comes from it. I even did the conversion in another computer but i keep having it. I reinstalled Tsukihime and made everything with a whole new and clean version but i keep ahving it. Won’t you be telling me how you do it? That’s it, it worked finaly, I just put the quality to 20%. But I think it’s just because of some luck, I think that to make it work you just have to repeat this process until the error doesn’t show anymore. Cuz the error was shown at random time. I started over 5times, the 5th i put quality 20% (even if i dont think thats thanks to that) and it worked. However I’ve got some question, just by curiosity I hope you’ll answer please. What do theses commands stands for? Ldid is to sign on an app? Those commands were required when I wrote my tutorial (and when everyone was using 3.1.2). Without those the app would not run. And yes, ldid is used to “sign” an app. 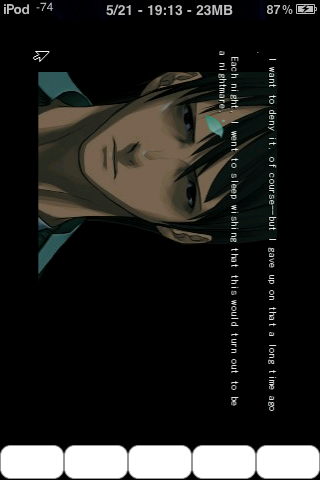 can you do this to other visual novels? I had some problem with the converter giving me the out.of.memory, I thought because I installed it on my second hard drive so I install it again on my c drive but still the same so I just kept trying it again then finally it says complete! I’m using windows 7 64bit, even tried using comparability more but still the same. Is there any way to get the music to play? It should be named 1 to 10 in mp3 isn’t it? Thanks. I got it to work with my ipod touch, my question now is, why is there no icon? is that normal? and if it is, how can i change the icon from blank (white/silver) icon to a tsukihime icon? Yes there’s only a blank icon, you can take your tskuihime.ico file from your installed game and rename it from tsukihime.ico to icon.png then put it in the tsukihime.app folder or or you’re using a theme from winterboard you can use the psd in Photoshop and add your own picture like I have. Btw Oneoc I notice in one of your screenshot that your with optus is it you’re from Australia by any chance? Yep, I’m from Australia. And regarding your other question you shouldn’t have any problems with music (and it looks like I really need to fix my converter) I’ll check later though (I don’t have Tsukihime on my phone right now). Have you restarted/resprung your device? I know, I had to renamed them track01.mp3 through to 10. Everything is working fine for now just wish the text were more eye friendly. Good to know that it works. As for the text, it is possible to make them bigger, I’ll write up a tutorial later (I don’t remember exactly how from the top of my head). And awesome, I’m from Sydney too! Cool to know another Aussie from syd that wants vn on iPhone too! I’ll try help out with what I can, if only I found this site earlier maybe because I was searching for fate/stay night for iPhone? I wouldn’t mind donating for the work you have done. Did you end up getting the icon to show the picture? So I got it to work without doing step 9, and when I ran the app I noticed that the top Info bar was still present while running. This made the game look off center and some of the text missing behind that bar. I was just wondering if there was a way to center the screen so that it would all fit or to hide the top bar all together when the game is running. Are you talking about the buttons on the right or left when you start the game? If it’s on the left, any chance you’re using notified (pro)? if so update to the lastest version I had some problems with mine when I get a mail notification and the gray status bar still stay there when I start some games. So update and/or check your notifcations so the gray bar goes. Do you have this in your Info.plist? Any news on enlarging the texts oneoc? Guh, I’m having problems with my install. I followed the directions perfectly, read all the comments, tried everything, and yet, it crashes when I try to play it. I’m running on an iPod Touch 3G, (32gb), iOS 4.0. Jailbroken with jailbreakme. I made sure everything was 777, got no errors with any of the terminal commands, and the other Tsukihime folder is where it needs to be. Nothing is working. Can someone tell me what’s up? And yes, I am using the proper onscripter. Ah! I got it now. I forgot to change the info around in the iOS 4 onscripter. And…. now it is crashing once it hits the main menu. Yay. Nothing on enlarging the texts yet….? Sorry for the late reply, but you will need to extract the script out of nscript.dat and edit all the setwindow commands. Go to http://nscripter.insani.org/reference/ and look up setwindow. Use the nscdec executable that is part of ONScripter Tools. This should give you a txt file with the script. Open it up and replace all instances of the setwindow command with one that has a higher value for the font size (once again check the reference). After that rename the txt 0.txt and place it in the folder where nscript.dat usually is and delete nscript.dat. The onscripter engine should now read from the 0.txt file. Cheers gor the reply, I’ll see if I can have a crack at it later. I checked the 0.txt file that I have already converted to my iphone and had a look. seems like the fifth group of numbers are the texts, I was wondering what number I should put? I’ll just try 21 and will keep you updated. I have edited group 5 and 6 to 26 but it still look the same….? Are you loading the game from a save file? Try to start a new game first and see what the font size is. Ok I got it!! group 5 and 6 renumber them 20,23 for all the setwindow except the first one. And yes I did load from a save file that’s why it wasn’t show so I had to start a new name for it to take effect. Thanks alot Oneoc! There are so many setwindow command. what number should I change? am I suppose to change all number there? The first setwindow don’t change only the second one onwards. Change 17 and 17 to 20 and 23 for the rest. That’s group 5 and 6.
there are more than 6 setwindow right? Unfortunately I do not have that device, if someone is able to compile or port over onscripter onto that then it is possible. This question is probably stupid, but could you tell me where is the converter? I downloaded all the files, but I cant find it. Does this work on iphone 3g 4.1 firmware? I worked on 3.12, but then I updated, so I wanted to know before I do it all over again. So I did all the instructions up to the ninth step, and I resprung. Now I’m locked out of my iPod with a changed password, and I can’t “unlock” myself back in via iTunes. I got SBSettings if that helps, so help? Scratch that, I just reset my iPod and it’s all good. Although, when are the buttons supposed to show up? Button’s on the right side just it doesn’t say anything… top is Menu, second is select, middle I think is skip, forth is up and fifth is down. Hi. I did the say thing as Dia and now I cant get in my iphone. I really dont want to restore it. Is there a way to unlock it, or find the changed password? I’m so very glad that someone has been working one this… however my game crashes when I try to start a new game… all I cna so it go to the menu and change settings etc! o.O now it’s working… there’s karma for ya! Good job! Nice icons 🙂 Edited the post to include them (with credits of course). Okay i got stuff fixed, but now im getting the ./minimal/mapping.h(54):_assert(2:false) error. I have the folders 777 and recursed. Please help!!!! I think your problem is you skipped step 1 and 2 which is to press su then enter then alpine after you open mobile terminal. Okay I finally did it:]!!!!! it was probably the fact that the Tsukihime.app was in mobile/applications and not the original applications file. Also for 4.2.1 firmware(i havent tried on other firmwares and won’t) you pretty much only need to do the chown -R root:admin step. If it doesnt work change the file back to 755, but still recurse the file. I found out because of this site http://www.iphooone.com/pukiwiki/index.php?%B7%EE%C9%B1. Only follow the file transfer and mobile terminal. The converter here makes life a lot easier than whats on that site. whenever i try to start it up it shows a black screen fro a second and then closes and goes back to the ipod home screen? how do i fix this? i am running ios 4.1 on an iphone 3g. and i could not find the recurse into subdirectories button so mayb thats y it doesnt work(using winscp). I recently updated to 4.2, and did all steps, so Tsukihime is working fine now. Only problem is save, I saw people talking about it up there, but didn’t really understand it: everytime I save, it always exits out, and doesn’t save. This is so epic, I finally got it to work on my iPhone 3GS [iOS4.0] and I am really excited about it. Any way to possibly get Plus Disc or Kagetsu Tohya working somehow? I would love that so dearly. Especially Kagetsu Tohya, as I have not read that much of it yet. but where can i get the tsukihime actual application? can you give the download address? The Tsukihime icon has no problem being the icon for any app other than Tsukihime. Is it required to put su root when using putty? because when i do the password doesnt work but when i dont put su and only put root the password works. Sorry for the late reply. And no, if you login through putty as root you don’t need to do su root. I did all the steps the icon is there. but when I push it the first time black screen with 4 buttons appears for like 3 secs then goes back to the home screen. Then if I push it again anytime after it just black scene for a second then back to home screen. on June 2, 2011 at 5:15 pm | Reply Dotter. Protocol error: Unknown protocol identifier (0x83 0x83 0x72). Most likely connected to the wrong port. I mean Step 7, sorry for that. Strange, what is your device/OS? Thanks 0neoc! It works perfectly on my iPod touch 4 (OS 4.3.3). Друг, а ты не мог просветить в каком именно файле ты это поменял? I cannot connect to the filezilla server on step 7! 😦 I’m sure the password is correct… help! Whenever I try step 9-6 I get: “chown: missing operand after ‘root:admin/Applications/Tsukihime.app” . Apart from that, when I try to launch I get a black screen and then it goes back to the menu. Am I missing something? I already renamed the GameFolder and such in info.plist. I’ve got a problem. The ONScrtpter works fine… Only wit JP version! I didn’t try the jap version but the english version doesn’t work on my 4s 5.0.1 it just crashed on startup. I have the same problem? but later I tried the JAP version and it working! Will this work on ios 5.0.1? Seems like only the jap version is working…. hope Oneoc can update it to support ios 5.0.1. But if to translate the game without changing the text’s encoding (it means to use build in english letters) I think it would work but how to do that and is there any english letters? I think the script is compatible for ios 5.0.1.. Sorry i meant NOT combatible with ios 5.0.1.. This version is supporting JPN games, not ENG. Ok sorry I never bother trying the jap version because I can’t read it.. maybe oneoc can shed some light on getting this english patch to work on ios 5.0.1…. Nothing about getting the english version working og 5.0.1..? But anyway – where is 0neoc?.. No idea he’s been MIA for a few months now… if only I have his address I’ll go check up on him as he’s from Sydney like I’am! Anyone manage to get this to work on iOS 5? Not for now that I know of. You could try, but its gonna be a long time until its officially updated. For all we know he could have moved on to an android, I did. U’ could try to use JP version of the game. It’s working on iPhone 4s with iOS 5, dut there is NO support for english. ADMIN, WHERE ARE YOU!? WE NEED YOU!! genuinely receptive once you exude the Tao Of Badass.